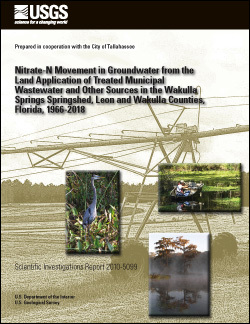 The City of Tallahassee began a pilot study in 1966 at the Southwest Farm sprayfield to determine whether disposal of treated municipal wastewater using center pivot irrigation techniques to uptake nitrate-nitrogen (nitrate-N) is feasible. Based on the early success of this project, a new, larger Southeast Farm sprayfield was opened in November 1980. However, a recent 2002 study indicated that nitrate-N from these operations may be moving through the Upper Floridan aquifer to Wakulla Springs, thus causing nitrate-N concentrations to increase in the spring water. The increase in nitrate-N combined with the generally clear spring water and abundant sunshine may be encouraging invasive plant species growth. Determining the link between the nitrate-N application at the sprayfields and increased nitrate-N levels is complicated because there are other sources of nitrate-N in the Wakulla Springs springshed, including atmospheric deposition, onsite sewage disposal systems, disposal of biosolids by land spreading, creeks discharging into sinks, domestic fertilizer application, and livestock wastes. 4. The Southwest Farm sprayfield at 4,500 kg/yr (7 percent). 3. Inflow to the study area across the lateral model boundaries at 36,000 at kg/yr (12 percent). All of the other sources were 5 percent or less. The Wakulla Springs discharge can change rapidly, even during periods of little or no rainfall. This rapid change is probably the result of Wakulla Springs intermittently capturing groundwater that has been going to the Spring Creek Springs Group. This spring group is located in a marine estuary and is affected by tidally influenced saltwater intrusion. Two modeling scenarios were simulated and results are presented for 2007 and 2018 in an effort to bracket the range of possible current and future changes in the flow of Wakulla Springs. In scenario 1, it was assumed that Wakulla Springs was not capturing Spring Creek Springs Group flow. In scenario 2, it was assumed that Wakulla Springs was capturing Spring Creek Springs Group flow. 3. Onsite sewage disposal systems at 24,000 kg/yr (12 percent). 4. Creeks discharging into sinks at 31,000 kg/yr (11 percent). All of the other sources contributed 8 percent or less. 4. Fertilizer at 17,000 kg/yr (11 percent). 5. Fertilizer at 32,000 kg/yr (12 percent). All of the other sources will contribute 6 percent or less. The simulated nitrate-N load from the Southeast Farm sprayfield to Wakulla Springs during 2007 through 2018 decreases from 111,000 kg/yr to 42,000 kg/yr in scenario 1 and decreases from 111,000 kg/yr to 43,000 kg/yr in scenario 2. Both scenarios show these decreases because of the simulated planned reduction in the concentration of nitrate-N in the wastewater used for irrigation from approximately 12 milligrams per liter (mg/L) in 2007 to 3 mg/L in 2018. In contrast, the simulated nitrate-N load from onsite sewage disposal systems to Wakulla Springs from 2007 through 2018 increases from 24,000 kg/yr to 32,000 kg/yr in scenario 1, and increases from 56,000 kg/yr to 80,000 kg/yr in scenario 2. Both scenarios show increases respective to the increases in population and residential and commercial sites using onsite sewage disposal systems. In addition, the simulated nitrate-N load to Wakulla Springs from 2007 through 2018 from inflow to the study area across the lateral model boundaries increases from 44,000 kg/yr to 48,000 kg/yr in scenario 1, and increases from 54,000 kg/yr to 57,000 kg/yr in scenario 2. Both scenarios show increases due to increasing nitrate-N levels upgradient in Leon County. Davis, J.H., Katz, B.G., and Griffin, D.W., 2010, Nitrate-N movement in groundwater from the land application of treated municipal wastewater and other sources in the Wakulla Springs springshed, Leon and Wakulla Counties, Florida, 1966-2018: U.S. Geological Survey Scientific Investigations Report 2010-5099, 90 p.